198th Siege Bty, Royal Garrison Artillery, 70 Heavy Artillery Group, B.E.F. Frank Tate was born in London and worked in Malvern as a postman. On 30th September 1907 he married Rosetta Rea at Christchurch, Great Malvern. They had two daughters, Marjory and Doris, both born in Malvern. He signed up under the Derby Scheme at Wolverhampton in December 1915 and was called up in June 1916. At enlistment he gave his address as 197 Bruford Road, Wolverhampton. At call up he was posted to No 4 Depot Royal Garrison Artillery based at Great Yarmouth. After training he was posted to 198th Siege Battery, R.G.A. on 22nd July 1916. He landed in France on 25th November 1916. The Malvern News reported in August 1917: “Gnr Frank Percy Tate, RGA (son-in-law of Mrs Rea, The Cottage, Barnard’s Green) has been killed in action. for some years he was a postman at Malvern, before becoming a postal clerk and went to Wolverhampton. He enlisted in June 1916 and proceeded to France in November 1916. The deceased was well known in the Malvern district and generally esteemed. He leaves a widow and two children, for who sincere sympathy is felt. 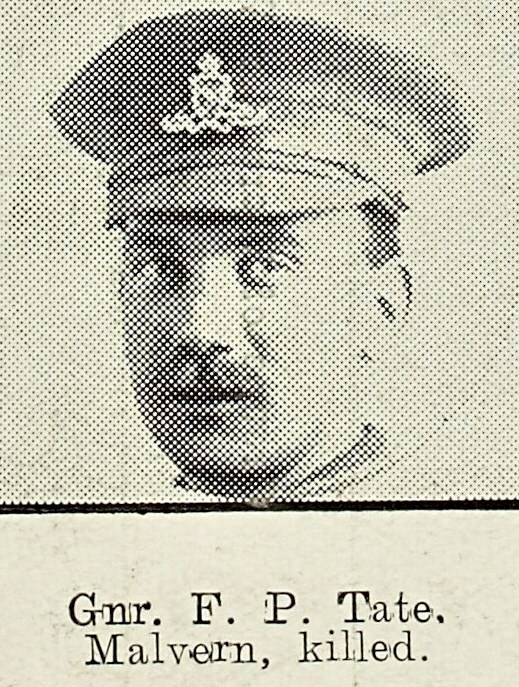 “Mrs Tate received the following from Major F Holman: ‘I am sorry to be the sender of bad news to you, but I feel I must write to you how deeply sorry all the officers and men of the Battery were at the lost of their comrade, your husband, who was killed in action at 8.30 this morning. I trust you will be sustained and strengthened to bear the heavy blow which it has – in common with so many of our womanhood – becomes your lot to bear. You will be glad to know that your husband suffered no pain; his death was instantaneous and that is, at least, a great consolation.